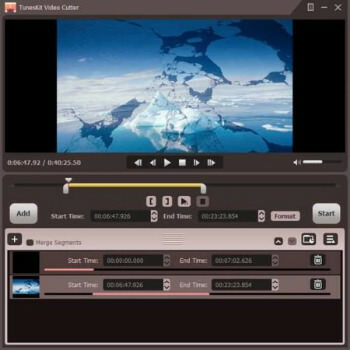 TunesKit Video Cutter for Windows is an easy-to-use video splitting tool specialized in trimming all kinds of video files, including AVI, MP4, MPEG, VOB, WMV, ASF, RM, RMVB, 3GP and other formats. This powerful video splitter must be the best choice for meeting your cut demands because it not only contributes to cutting videos into segments, but also merges different video clips from the same source file into a new video. Wanna remove unwanted footage from a specific video without causing quality loss to the original file? No problem! TunesKit Video Cutter for Windows could be your best choice as it can split any video and audio into small files without losing any quality. Besides, being embedded with precise media cutting technique, it enables you to trim any video/audio as accurately as possible by setting the temporal interval to millisecond. With the built-in video editor, you can edit and customize the videos before cutting with flexible effects, including cropping, trimming, adding subtitles and watermarks, adjusting the contrast, and much more to make the videos more personalized. You don’t need to worry about the playback compatibility between the video cuttings and mobile devices, as TunesKit Video Cutter for Windows provides a full range of pre-set profiles for all popular portable devices and media players, including Apple, Samsung, game consoles, smart TV, and so forth. You can directly cut and save the videos/audios into any target device as expected. Like TunesKit’s other products, this smart video cutting software is also equipped with advanced accelerator that makes the video cutter work at up to 60X speed, much faster than any competitive program in the market. In addition, to make the cutting more visualized, it embeds an instant media player so that you can make any change to the cuts at anytime as you want.